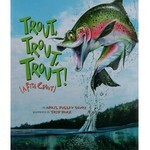 A wildly popular gift for fishermen young and old, this fish chant is a celebration of North American freshwater fish. Rhyme, rhythm, repetition, voice, and wacky illustrations bring this book to life. The backmatter is full of facts about each fish. If you’re studying rivers, streams, lakes, fish, or just how to have fun with words, this book is a great resource, not to mention plain ol’ fun.For standards, see standards page. Great Lakes Book Award Winner! This was voted by the children of Michigan. "This is a really cool book with great humorous pictures to share with your favorite little 'fisherperson' around the campfire..." Review by Linda Wright -Book Sense, the publication of independent booksellers nationwide.